Over the past couple of years I have become very interested in a little bird called the western snowy plover and in doing so, an acquaintance with Carleton Eyester, an ecologist with Point Blue Conservation Science. Through meeting Carleton, I have been priviledged to accompany him on visits to plover nesting sites as he monitors their progress and in doing so, am able to capture images and video footage I would normally not have the ability to do. The western snowy plover is a threatened small shorebird, approximately the size of a sparrow. During the breeding season, MARCH through SEPTEMBER, plovers can be seen nesting along the shores, peninsulas, offshore islands, bays, estuaries, and rivers of the United States' Pacific Coast. 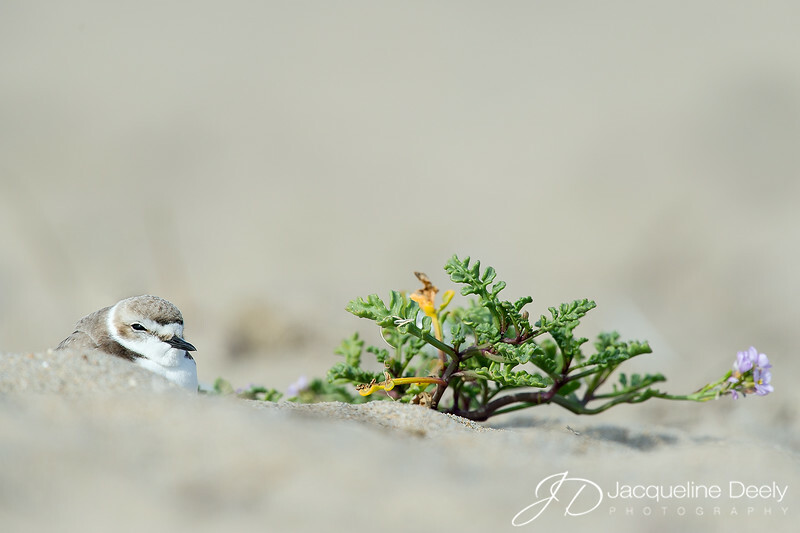 Plover nests usually contain three tiny eggs, which are camouflaged to look like sand and barely visible to even the most well-trained trained eye. Plovers will use almost anything they can find on the beach to make their nests, including kelp, driftwood, shells, rocks, and even human footprints. Snowy plovers have natural predators such as falcons, owls, raccoons, and coyotes. There are also predators that humans have introduced or whose populations they have helped to increase, including crows and ravens, red foxes and domestic dogs. Humans can be thought of as predators too, because people drive vehicles, ride bikes, fly kites, and bring their dogs to beaches where the western snowy plover lives and breeds. All of these activities can frighten or harm plovers during their breeding season. Energy is very important to this small bird. Every time humans, dogs, or other predators cause the birds to take flight or run away, they lose precious energy that is needed to maintain their nests. Often, when a plover parent is disturbed, it will abandon its nest, which increases the chance of a predator finding the eggs, sand blowing over and covering the nest, or the eggs getting cold. This can decrease the number of chicks that hatch in a particular year. Did you know that a kite flying overhead looks like a predator to a plover? A kite over a nesting area can keep an adult off the nest for long periods of time. There are many key things YOU can do to help save the western snowy plover! Allowing these small birds to remain in their breeding area, undisturbed, throughout the breeding season is most important. People should be able to recreate on the beaches AND there should be room for plovers to nest too. The idea is to "Share the Shore." This means having fun while protecting our natural environment at the same time. The western snowy plover has been living on the Pacific Coast for thousands of years, but was listed by the federal government as threatened in 1993, due to low population and decreased habitat. Let's help ensure the plovers' success! Remember that when a species goes extinct, it is gone forever! We are privileged to be able to be stewards of the beach, its habitat, and its occupants, including the western snowy plover. Protect your beach and the plants and animals that use it and most importantly, share your knowledge with friends and family. Get the word out; we can make a difference and that difference starts with you.